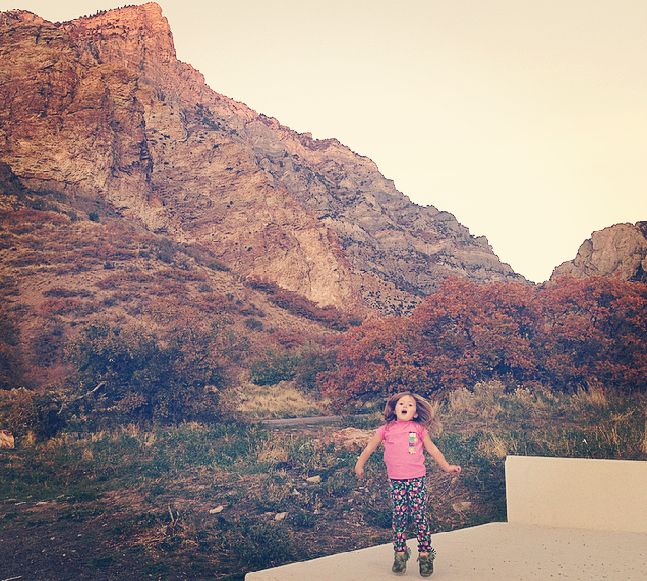 Ever today at Rock Canyon just after sunset. I was changing the baby's diaper this morning when Ever walked into the room. "Hey Mom," she greeted me as she picked wispy cotton strings off her mint-colored blanky--a behavior associated with Ever deep in thought. "Hey Ever," I said back. "You know how sometimes you call Iris Lady?" "I don't think you should call her that anymore." "Because ladies are not babies." "Ladies are old. They have silver hair and lines carved into their faces and they walk with sticks cause they can't stand up straight." "Okay, so don't call her Lady anymore," she said to me turning around, leaving the room with finality as if to say, Glad we had this chat. And I was left to finish the diaper job, wash my hands, and dress Iris in her signature stripes. But I couldn't help pondering this: how does she think those lines get carved in to ladies' faces?